Beef Bulgogi is one of my favourite dishes to eat in a Korean restaurant and it’s been on my list of dishes to make Weight Watchers friendly for a good while now. Since I always have Gochujang paste in my cupboards (as the hubbie and I both love my Korean Bolognaise) I thought it was about time I got around to making it! For anyone who hasn’t tried Gochujang chilli paste , it really is worth giving a go. I get mine online (I’ve ordered from both eBay and Amazon) but you can also pick the paste up in most large supermarkets (I’ve bought it in Waitrose and Sainsbury’s before). It’s really worth making the effort to get a hold of as it has the most delicious flavour, unlike any other chilli sauce I’ve tried. I’ve already got a few other recipes on my site which use it so you may have it in already! I’ve included the recipe for my Spicy Peanut Dip below which is a great way to finish the dish. If you haven’t got all the ingredients for the dip, feel free to leave it out and simply serve with a wedge of lime per person. The dip also works beautifully as a salad dressing! Mix below ingredients in a bowl and use water to loosen to your preferred consistency. Add all of the marinade ingredients to a large bowl and mix together. Add the steak, onion and leeks, coat everything in the marinade and then cover the bowl with cling film. Leave to marinade in the fridge for anywhere between 30 minutes and overnight. Once you are ready to cook, take a large frying pan or griddle pan, spray with 1kal and heat to high. Remove the steaks from the onion/leeks, letting any excess marinade drip back into the bowl, and begin cooking the steaks to your liking (we like ours pink in the middle so I cook for 3-4 minutes on each side). Once cooked to your liking, pop the steaks to one side, onto a plate to rest. While they are resting, stir fry the onions and leeks in the same pan you cooked the steak in (add a little water to keep the pan lubricated and to stop the marinade burning). Once rested for a few minutes, slice the steaks into strips. Then turn the heat off the pan and toss the meat all together with the stir fried onion and leeks. Serve with accompaniments of your liking. 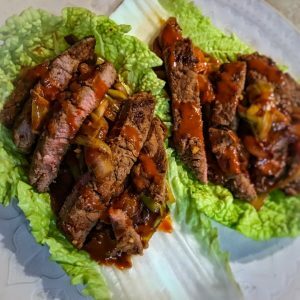 I chose to wrap the Bulgogi in lettuce cups and the hubbie had his with lettuce cups a small portion of lemon pepper rice (40g dried – add an extra 4sp). I also served both with some stir fried tender stem broccoli (0sp) which I stir fried in the pan after I removed the steak, onions and leeks. I also finished the dish with a drizzle of my spicy peanut dip which was a lovely way to make the meal feel a little extra special. This was delicious! Really moreish. I used extra onion as I didn’t have a leek. If there’s two of you, I would definitely advise making only two portions – if you make four, it’s too tempting to scoff the lot! The spicy peanut dip was lovely too and I used the leftover on a roast chicken salad the next day. OMG! Made this last night for the first time – I can’t remember when I had a beef dish I enjoyed more. And to think it’s Weight Watchers friendly – bonus. You are a very clever lady Laura, should be doing your own TV show 😍.